While many of these skills are learned in the classroom, much of the coursework takes place in our newly remodeled auditorium. Built in 1925, the auditorium holds 1,000 people and was refurbished in 2009. More recent additions include updating the sound and lights and adding new microphones. Outside of the classroom, Memorial hosts many theatre opportunities including both a fall play and spring musical, participating in Drama Club and both the Indiana Thespian and International Thespian Organizations, competition at the regional and state level, and involvement in the State Thespian Association. The hard work and efforts of these talented students and faculty members earn a variety of honors. 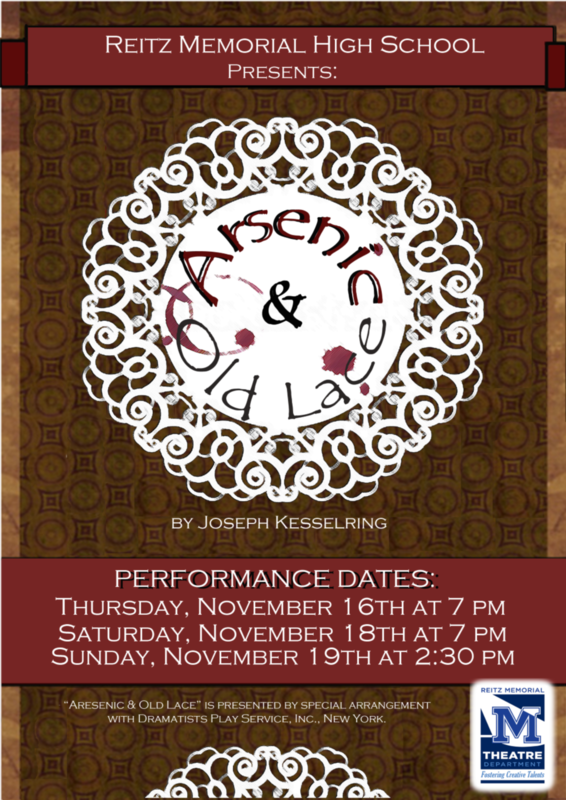 Reitz Memorial High School's Theatre Arts Department presents the Fall Play: Arsenic & Old Lace by Joseph Kesselring. The play is a farcical black comedy revolving around the Brewster family, descended from the Mayflower, but now composed of insane homicidal maniacs. We will have open seating with a reserved section for family members of the cast and crew. General admission will be sold at the door. Ticket prices are $6 for children/students/seniors, and $8 for adults.